It was a very clean and friendly atmosphere. The pool was huge and my kids loved it. Plenty of dining options. The location was perfect. The boat rides were 6 minutes away from universal studios! Couldn’t have asked for a better place stay. We were first put in a room with a broken air conditioner on the top floor at the opposite end of the elevators and had carried our luggage up the stairs. They moved us to a poolside room on the bottom level that was nicer. This was a nice property considering what I paid for it and it's proximity to Universal Orlando. Looking for a great deal on a hotel near Universal Studios Florida™? Then Orbitz is the only place to book! Not only is Universal Studios Florida™ a major attraction, but Orlando also has so much to offer travelers. On top of plenty of great places to stay, there are other attractions to visit in Orlando when you’re done at Universal Studios Florida™. Book your vacation to Universal Studios Florida™ with Orbitz for a trip you won’t soon forget. When it comes to finding hotels near Universal Studios Florida™, an Orbitz specialist can help you find the right property for you. Chat live or call 1-800-454-3743 any time for help booking your hotels near Universal Studios Florida™. Our team of experts can help you pinpoint Orlando hotel options suited to your tastes and budget. On Orbitz, Orlando hotel deals mean flexibility. If you need to change your Universal Studios Florida™ hotel reservations, or cancel your stay, Orbitz doesn't charge cancel or change fees. Orbitz also offers great selection on airline tickets, vacation packages, and car rental deals to so you can plan your trip all in one place. Are there hotels with free wifi near Universal Studios Florida™? Definitely. After a long day out in Orlando at Universal Studios Florida™, it’s nice to come back and relax at your hotel knowing they have free wifi. Binge on your favorite online show, or check the weather forecast and plan your activities for the next day. Either way, hotels near Universal Studios Florida™ with free wifi are the best option for your trip. Instead of scouring the web to find all the Orlando hotels with free wifi, browse our listings of the best hotels offering free wifi near Universal Studios Florida™. Four Seasons Resort Orlando At Walt Disney World Resort has rooms. It is a 5.00 star rated hotel that offers free wifi. Wyndham Grand Orlando Resort Bonnet Creek has rooms. It is a 4.00 star rated hotel that offers free wifi. B Resort and Spa located in Disney Springs® Resort Area has rooms. It is a 4.00 star rated hotel that offers free wifi. Orlando World Center Marriott has rooms. It is a 4.00 star rated hotel that offers free wifi. Can I book hotels near Universal Studios Florida™ with free breakfast? This hotel is located 7.2 miles away from Universal Studios Florida™. The hotel offers free breakfast and has a 3.00 star rating. Book Best Western Lake Buena Vista - Disney Springs® Resort Area now! This hotel is located 8.7 miles away from Universal Studios Florida™. The hotel offers free breakfast and has a 4.00 star rating. Book Lake Buena Vista Resort Village & Spa a staySky Hotel/Resort now! This hotel is located 7.6 miles away from Universal Studios Florida™. The hotel offers free breakfast and has a 4.00 star rating. Book Hilton Orlando Buena Vista Palace - Disney Springs® Area now! This hotel is located 8.6 miles away from Universal Studios Florida™. The hotel offers free breakfast and has a 3.50 star rating. Book Holiday Inn Resort Orlando Suites - Waterpark now! Are there pet-friendly hotels near Universal Studios Florida™? Yes, there are. Don’t want to leave the pups behind on your trip to Orlando? You don’t have to! At Orbitz, we know no trip is complete without man’s best friend. That’s why we’ve found these awesome hotels near Universal Studios Florida™ that allow pets. Caribe Royale All-Suite Hotel is a pet-friendly hotel near Universal Studios Florida™ that has a 4.00 star rating. The hotel is located only 8.4 from Universal Studios Florida™. Hilton Orlando Bonnet Creek Resort is a pet-friendly hotel near Universal Studios Florida™ that has a 4.00 star rating. The hotel is located only 9.2 from Universal Studios Florida™. Disney's All-Star Music Resort is a pet-friendly hotel near Universal Studios Florida™ that has a 3.00 star rating. The hotel is located only 11.2 from Universal Studios Florida™. Wyndham Lake Buena Vista Disney Springs® Resort Area is a pet-friendly hotel near Universal Studios Florida™ that has a 4.00 star rating. The hotel is located only 7.5 from Universal Studios Florida™. Where can I find hotels near Universal Studios Florida™ with restaurants? Although it’s fun to taste the local cuisine on your trip to visit Universal Studios Florida™, sometimes it’s nice not to worry about what’s for dinner or where to go. Our hotels with restaurants in Orlando will allow you to just lay low after a day of exploring Universal Studios Florida™ and enjoy a great meal without leaving the comfort of your hotel. Book Red Lion Hotel Orlando - Kissimmee Maingate. This is a 3.00 star hotel with a restaurant. The hotel is located 12.1 from Universal Studios Florida™. Book Disney's Contemporary Resort. This is a 4.00 star hotel with a restaurant. The hotel is located 7.7 from Universal Studios Florida™. Book Wyndham Bonnet Creek Resort. This is a 3.50 star hotel with a restaurant. The hotel is located 9 from Universal Studios Florida™. 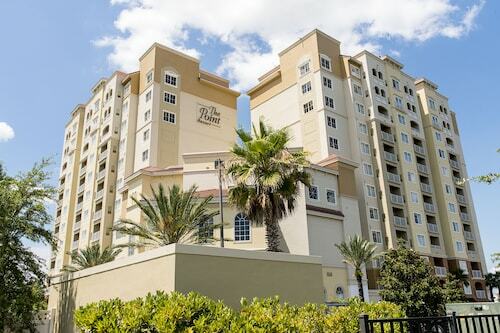 Book Westgate Palace a Two Bedroom Condo Resort. This is a 4.00 star hotel with a restaurant. The hotel is located 1.5 from Universal Studios Florida™. What are the best deals on Universal Studios Florida™ hotels with pools? If you want to cool off in the pool after a great day out in Orlando exploring Universal Studios Florida™, our deals are just what you need. We offer discount rates on the top hotels near Universal Studios Florida™ that have pools. Disney's Port Orleans Resort French Quarter is a 3.50 star hotel with a pool that’s located 7.9 from Universal Studios Florida™. Hyatt Regency Orlando International Airport is a 4.00 star hotel with a pool that’s located 10.5 from Universal Studios Florida™. Universal's Hard Rock Hotel ® is a 4.00 star hotel with a pool that’s located 0.4 from Universal Studios Florida™. Universal's Loews Royal Pacific Resort is a 4.00 star hotel with a pool that’s located 0.5 from Universal Studios Florida™. Are there hotels near Universal Studios Florida™ with parking? If you’re planning to drive around Orlando, or if you want to leave your car somewhere safe to walk from your hotel to Universal Studios Florida™, you’ll want to check out our deals on hotels near Universal Studios Florida™ with parking. We've found deals on bookings for hotels near Universal Studios Florida™ that have parking on-site for guests. Disney's Animal Kingdom Lodge has a 4.00 star rating and offers parking for guests. Located just 11.4 from Universal Studios Florida™, this hotel is a steal. Waldorf Astoria Orlando has a 5.00 star rating and offers parking for guests. Located just 9.4 from Universal Studios Florida™, this hotel is a steal. Disney's Yacht Club Resort has a 4.00 star rating and offers parking for guests. Located just 9.1 from Universal Studios Florida™, this hotel is a steal. 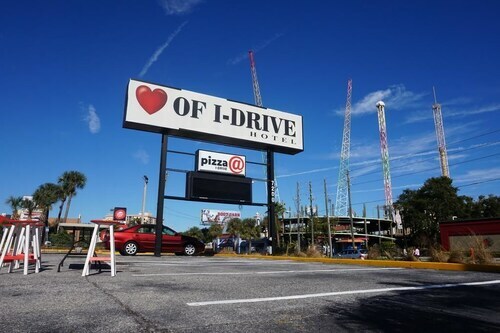 Floridays Resort Orlando has a 3.50 star rating and offers parking for guests. Located just 6.3 from Universal Studios Florida™, this hotel is a steal. Is there 24-hour concierge service at Universal Studios Florida™ hotels? Sometimes travel can be unpredictable. Maybe your flight gets delayed and you miss check-in time, or you decide to stay late at Universal Studios Florida™ and return after the front desk is closed. Either way, you don’t want to get stuck without 24-hour concierge services at your hotel near Universal Studios Florida™. Try Universal's Loews Sapphire Falls Resort This hotel has a 4.00 star rating, 24 hour concierge, and is located only 0.7 from Universal Studios Florida™. Try Disney's Coronado Springs Resort This hotel has a 3.50 star rating, 24 hour concierge, and is located only 10 from Universal Studios Florida™. Try Walt Disney World Swan This hotel has a 4.00 star rating, 24 hour concierge, and is located only 9.5 from Universal Studios Florida™. Try Gaylord Palms Resort & Convention Center This hotel has a 4.00 star rating, 24 hour concierge, and is located only 9.8 from Universal Studios Florida™. Can I book a hotel near Universal Studios Florida™ with non-smoking rooms? Sometimes it’s nice to explore a new area on foot to really get a feel for the lay of the land. Explore Orlando like a local and stay within walking distance of Universal Studios Florida™ without going over budget. Avanti International Resort is only 2.7 away from Universal Studios Florida™ and offers non-smoking rooms. Sheraton Vistana Resort Villas- Lake Buena Vista / Orlando is only 7.8 away from Universal Studios Florida™ and offers non-smoking rooms. Hyatt Regency Orlando is only 3.5 away from Universal Studios Florida™ and offers non-smoking rooms. The Point Hotel & Suites is only 1.6 away from Universal Studios Florida™ and offers non-smoking rooms. What are the top 5-star hotels near Universal Studios Florida™? If you’re interested in 5-star hotels near Universal Studios Florida™, there are 2 to choose from. To help you narrow down your search, we’ve pulled together some of the best deals for you. Four Seasons Resort Orlando At Walt Disney World Resort: is a 5.00 star hotel that's only 6.8 from Universal Studios Florida™. Waldorf Astoria Orlando: is a 5.00 star hotel that's only 9.4 from Universal Studios Florida™. Where can I book 4-star hotels close to Universal Studios Florida™? Caribe Royale All-Suite Hotel is a 4.00 star hotel that is only 8.4 away from Universal Studios Florida™. Universal's Loews Royal Pacific Resort is a 4.00 star hotel that is only 0.5 away from Universal Studios Florida™. Walt Disney World Dolphin is a 4.00 star hotel that is only 9.4 away from Universal Studios Florida™. Disney's Animal Kingdom Lodge is a 4.00 star hotel that is only 11.4 away from Universal Studios Florida™. What are the cheapest 3-star hotels near Universal Studios Florida™? Looking to save a little cash on your trip to visit Universal Studios Florida™? We get it. You want to splurge on outings and activities, without blowing your budget on hotel rooms. Our 3-star hotels are perfect for a budget-friendly trip to explore Orlando and check out Universal Studios Florida™. Browse our best deals on 3-star hotels near Universal Studios Florida™ below. Universal's Cabana Bay Beach Resort is located just 0.7 away from Universal Studios Florida™ and has a 3.00 star rating. Disney's Pop Century Resort is located just 9.7 away from Universal Studios Florida™ and has a 3.00 star rating. Holiday Inn Resort Orlando Suites - Waterpark is located just 8.6 away from Universal Studios Florida™ and has a 3.50 star rating. Disney's Port Orleans Resort - Riverside is located just 7.5 away from Universal Studios Florida™ and has a 3.50 star rating. Pros: It is very close to Universal Studios. The price was great if all you want is somewhere clean to sleep and to be close to things to do and eat. Cons:It does not have a microwave and the only way to turn on the TV is by putting your door key in a key slot on the wall, which made it bothersome because they only provide 1 room key. I would not recomend the onsite laundry facitity. It was ok at $2 per wash but at $2 per load and each load required $4 to completly dry the clothes and the detergent dispensery takes your money, it did not work. They only provide 2 towles, wash clothes per day.